Katie's Blog: Something to Share! Well, I pulled my finger out and made an effort to stop looking at stuff on-line and actually do things that I have been thinking about. The result is a one of a kind cut file for my Cameo and a finished layout from the long finished Bright Ideas class over at Studio Calico! Yay me! 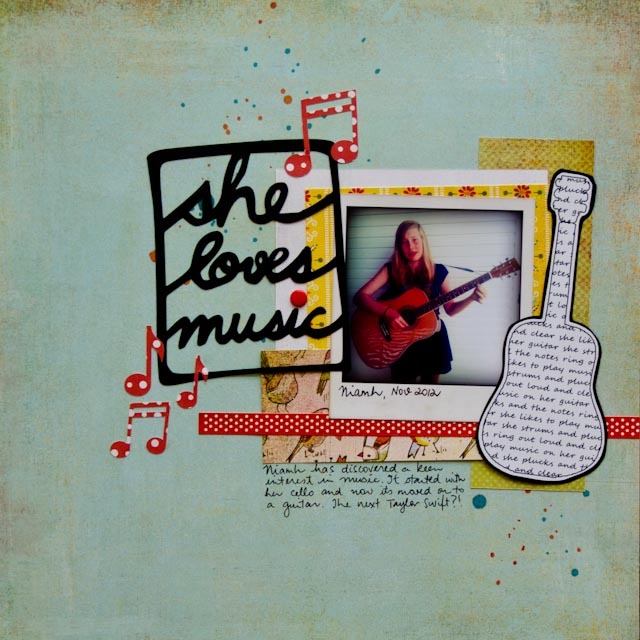 So the challenge for this Bright Ideas task was to create shaped text to somehow include on your page.I decided to do a guitar filled with my own words about Niamh liking to strum her guitar. My favourite part of this page however was the title card that I created and then cut with my Silhouette. (geez I love this machine!). So lets get down to it and play show and tell! So I drew the card and then scanned it in and finally imported into the Studio software to create my cutting file. Pretty nifty isn't it??!! Well I am pleased even if no one else is! The wonder of being able to include my own handwriting in a title without having to use a craft knife to finish it off! I also cut the musical notes with the Silhouette too, just to finish it all off. All in all something that I am most pleased with! So, if you like the title card, and have a Silhouette I have decided to let you have a copy of the file! You can find the file here, just please mention me if you do use it, and come back and let me know too so I can see how you used it! Well, that is enough for today. Although it has spurred me on to go and create some more!